No recipes for the last two Wednesdays because I was in the US. Now I'm back, so are the recipes. To make up for the two missing ones, there are three beers today. Just kidding. It so happens that Kristen has a three-way party-gyle from Fullers. Including one of my obsessions, AK. And an XK. Don't ask me what the hell that means. I still haven't worked out AK. I'll hand you over now to Kristen. So this is IPA month but I figured that just because something isn't specifically called an IPA doesn't mean it doesn't have a lot of the same characteristics. Fullers XK from 1920 is pretty much right along all the other spec's of IPAs that I've seen...its just called an XK. This log is from 1920 as you can plainly see so its after WWI but you'll still notice that the BUs are low for all of the beers. This log is something really different though in that there are 3 beers made from the same mash. This is the proper way to gyle beers. Basically you take 2 or so worts and blend them to make different beers after they have been boiled. Below I have created a simple recipe for the XK alone so people that are less inclined to be fancy can try their hand at it. I've then done a direct translation from the logs of how to make all three using Fullers gyle technique which they still do to this day. (not intensive purposes here) we'll use water. The pro-guys can pull off some return if they like. - Each brewery does everything a little different. A good rule of thumb is to follow the pounds/bbl for each gyle. What I mean is that for this specific beer set the first and second gyles are about equal volume. The hopping rate is about 1.61lb/ bbl so for our instance you would add the same amount of hops to each gyle. Remember that the 2nd gyle is quite low gravity which means that the actual utilization of the hops will be much greater than gyle one being about 30bu for gyle 1 and 44bu for gyle 2. - Its quite simple actually. You'll be brewing twice as much as you normally would be (for this recipe). I've broken down the blends for you as you can see. Basically each different beer, PA, AK and XK, will receive a differing amount of each gyle. For example, if we look at HB metric version you'll actually end up brewing 38L and then need about 5.5L of water to blend. The first fermenter would need 11.31L of Gyle 1, 4.4L of gyle 2 and 0.76L of water for a total of 16.37L. The OG of this, if you have hit your gravities and volumes correctly, should be about 1.056 w/ 33bu. Make sense? A few years after the war sees to it the return of fresh and choice malt. No1 malt is the best they use and can be subsituted for Maris Otter, Golden Promis or the like. Again we see Californian 6-row as it was thought that a blend lended a superior product than the plan No1 alone. You'll notice that there is a lot less sugar added than in the other IPAs but also notice that flaked maize takes its place. They use a 50:50 blend of No2 invert and glucose. Should be able to split the difference and use invert #1 or golden syrup in a pinch. Talk about doggy. 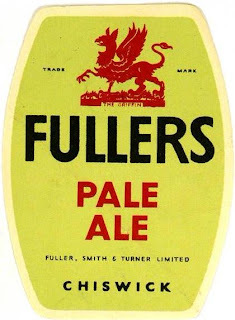 Even though there was a glut of hops at the end of WWI I'm guessing that Fullers had a good supply of older hops they needed to get through. Some of these things are nearly 5 years old. Not to mention the fact of where they are from...France and the US. The Alsace should be of the Hallertauer variety. Sourmas...I have no bloody idea but could be something similar to Hallertauer so we'll just go with that. Standard Oregon Cluster hops as per the usual. Nothing at all special here. Extended fly sparging which means that you had better be damn sure you have your hot liquor pH'd correctly. Floral, herbaceous and grassy. Toffee, corn and rich tea biscuits. Distinctive drying finish with an extended 'strong tea' tannic character. PA - Stronger malt component with sweeter finish. AK - Similar to the PA but with less of everything. Finish will be quite tart. XK - Tartest, driest and most tannic of the three. Fascinating to see that Fuller's parti-gyle brewing goes back that far. Ed, it goes back even farther. In the oldest records they still have (from the 1880's) they were party-gyling. It's such a clever idea I'd always assumed it was a more modern development. I guess these old brewers knew a thing or two. Of course! It's a shame that many people seem to think that any ancient craftman was no more than a guesser and a "I will do it this way because we always did it like this..."
Brewers have ALWAYS parti-gyled, to the extent that each mash was treated separately (first for strong beer, second for weaker beer, third for small beer, each with different hopping regimes depending on how long they were expected to keep) and putting all the mashings in together to make one "entire" brew seems to have been the exception, hence "entire" as an early name for porter. Zythophile, the 19th-century form of party-gyling was to use some of each gyle in every beer. Just using different proportions to get different strengths. Party-gyling was very prevalent amongst the London breweries. Most of the brews were party-gyles. The only exceptions are beers that were being brewed in huge volumes, like standard Porter in the first half of the century and X Mild in the second.